Hide the women, children and adorable pets, the Legion of Doom is in the house! No thanks to the USPS Wendy Berrell's submission to the fly swap has finally arrived. 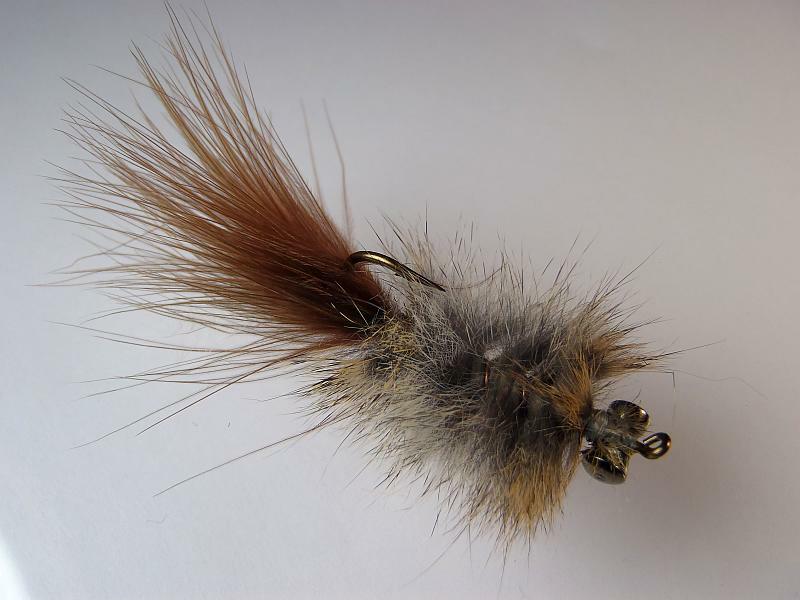 I love the flattened wide profile of this fly and in case you haven't noticed I am a big fan of soft fur on carp flies. Packages are on the way, the first nine went out today first class parcel with tracking thanks to my beautiful wife. I made the executive decision to hold the rest off in order to give the LOD a fair shake and if you aren't in the first wave it probably means you get one or provided them. Those packages will trickle out over the next week or so. Just remember I didn't promise fancy packaging. As a matter of Zack made the foam circles I am using to keep the flies from tangling for a quarter a piece. Don't tell his Union Rep I told you, but the little money grubber got the best of Daddy and pumped those things out at a 20 buck an hour velocity. That's me boy! And yes, I am cheap enough and was amused enough to sit down and calculate it. Nice fly, Im packed up and ready go for an afternoon session on Mr. Carp. I like your patterns, you have good patterns. Thanks for waiting on these flies. I can offer no explanation as to the delay. You might grab your local mail carrier by his lapels and shake hime a bit in pursuit of that answer. Bob, I may not have been very clear on this post. This is Wendy Berrell's (google Fishing and Thinking in Minnesota) submission to the fly swap, you will have to take that up with him. I will update the post tonight so that people don't think this is my fly. It is a sweet one for sure though. You're the man, McTage! Can't wait to put those flies in front of some Georgia carp. I might have to bug Wendy as well for the how-to on the LOD. That is one bad lookin' dude. I demand a submission of the recipe. I've already said that fly was the essense of triggerousity. But, much thanks to your wife and Zach as well. And, again, this was a great thing you did McTage. Gregg - Triggerousity! Making up words is one of my favorite activities. Good notes. But sink rate still worries me. I'll put the original LOD and the zonked-out version in a tub of whiskey tonight and use a stopwatch.